Drivers passing the village sign which reads “Sutton with Shopland” may wonder what this strange name means. In fact, it is the name adopted in 1933 when Sutton Parish was formed from the two original parishes of Sutton and Shopland. Now there seems very little left of Shopland itself, which in the past must have been a thriving community worthy of its own status as a civil parish. A church was shown at Shopland on old maps but it was demolished in the 1950s following wartime bomb damage. Now there is not much left of the village. That is until you follow the footpath along a narrow, potholed track marked “Private Road”. At first you may not notice anything particularly interesting: fenced paddocks, rough ground, a few clumps of bushes and trees. 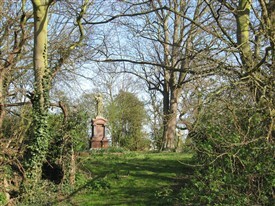 Then, amongst the trees, appears the extraordinary and elaborate memorial dated 1910 to Lewis Alexander Utton. 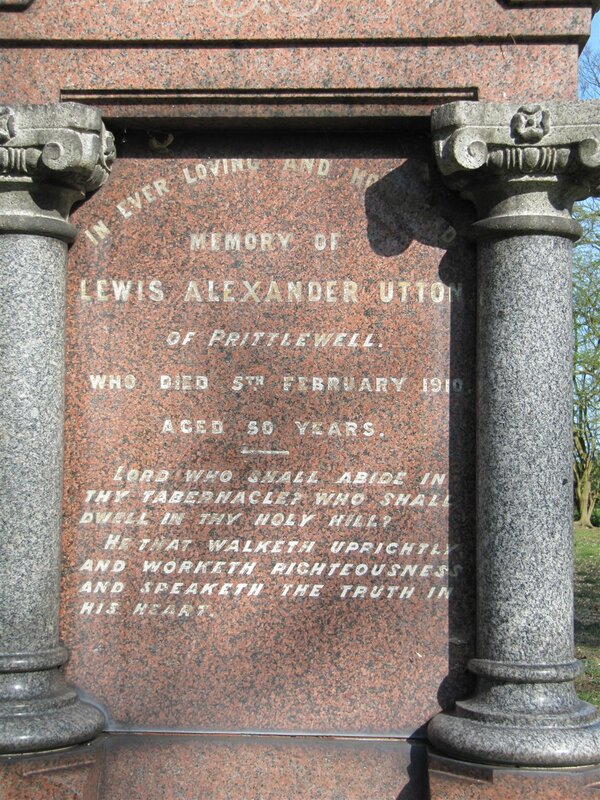 This elaborate memorial is evidence that Lewis Utton was a wealthy businessman. Mr Utton was a borough councillor who had hopes of being elected mayor of Southend. He came from Prittlewell and owned property all over the borough. Mr Utton died suddenly at the age of 50 while watching a football match. He had just recently bought Shopland Hall with the intention of developing brick fields on the land. The whole area is riddled with holes and dozens of rabbits scatter as you follow a grassy path between two large trees into what must have been the old churchyard. Further on, risking twisted ankles, if not an Alice-in-Wonderland type tumble into the depths of a rabbit hole, you come across a lot more grave stones. 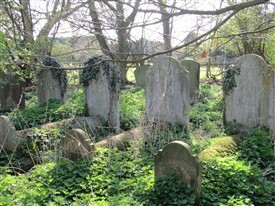 They seem very old indeed but it is hard to read any inscriptions due to the moss and ivy which covers everything. Nothing at all is left of the church building. Once a year there is still a religious service held there to rededicate the site but most of the time the old churchyard of Shopland is a forgotten, peaceful place, left to the songbirds and rabbits. In springtime purple and white violets and golden celandines grow in profusion among the ancient stones. This page was added by Sue Horncastle on 06/04/2012. It would be interesting to know a bit more about the wartime action which damaged the church. I know that the bell went to Vange church and has recently been restored. Thanks for your comment, Janet. Do you have any photos or memories that you could share with us about your childhood in the area? My grandad lived in Ivy Cottage on Sutton Road.